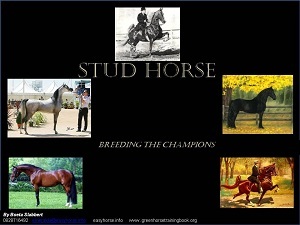 In STUD HORSE I share my greatest passion in my earthly existence: horse breeding. STUD HORSE consists of three parts. Part 1 is based on my personal views, observations and experience. In this section I attempt to explain the systems I applied to found and develop various livestock studs from virtually nothing – sheep, cattle and my greatest passion: horses. In all cases I always invested a minimum and counted on sensible matings, rather than spending a fortune on expensive breeding stock. No breeder has ever succeeded in “buying” success in stud breeding !!! Part 2 is based on research, especially on the breeding principles of perhaps the shrewdest breeder of all time: the Italian Thoroughbred breeder, Frederico Tesio. Tesio never spent a fortune on breeding stock, neither did he ever own many mares. He also sent his mares out for service and never stood his own stallion, smart man as he was. But if there ever was a man who understood how a pedigree works, it was Tesio. I spent weeks doing research on Tesio’s principles. I was encouraged to find out that, with the exception of a few (very valuable) principles, there was little difference between what I’ve been doing and the principles which were responsible for Tesio’s success. However, what I learned while doing that research, is to my mind knowledge and information which very, very few livestock breeders are aware of. In STUD HORSE I share everything I discovered during weeks of research, with my readers. Part 3 is still being developed and consists of questions I asked to some of South Africa’s top geneticists. The goal of this is to investigate whether there is scientific support for some beliefs among horsemen. It is my sincere desire that this book may help you to breed and develop the stud of your dreams.